Ricard Espelt, Enrique RodrÃ­guez and I have just published a new article, Â¿EconomÃ­a alternativa o tecnopolÃ­tica? Activismo desde el consumo cooperativo de productos agroecolÃ³gicos [Alternative economics or technopolitics. Activism from agroecological products cooperative consumption] which analyses the relationship between technopolitics and the cooperative movement. Our hypothesis is that some emerging cooperatives go beyond the mere practice of cooperativism for production or consumption, and engage or even are driven by political values. Our findings only partially support this hypothesis, but allow us to characterise three types of cooperatives according to these political values and activism, which we found quite interesting. Agroecological cooperativism is made up by an inter-cooperation network articulated by producers and consumer groups that promotes the acquisition of agroecological products in the context of the Social and Solidarity Economy (MartÃ­n-Mayor et al., 2017). At the same time, as part of the anti-globalisation and territorial defense movement, it has political resolution (Vivas, 2010). In this sense, it frames its activity as a response to the homogeneity of global food chains (MauleÃ³n, 2009; Khoury, 2014) and promotes a recovery of the Â«identity of the sitesÂ». This re-appropriation purpose is expressed -especially- in the social movements that emerged during 2011 that, according to Harvey (2012), link with the fight against capitalism and the demand for a collective management of common goods and resources. Across the area of Barcelona, where the map of consumer cooperatives is well defined (Espelt et al., 2015), it has been registered an increase of these kind of organizations during the 15M or the Spanish â€œIndignadosâ€ movement in 2011. As embedded in the era of the Network Society and the expansion of Information and Communication Technologies (ICT), this article studies the correlation between agroecological consumer groups, as an instrument to promote an alternative economy, and social movements, as the space where technopolitics develop (Toret, 2013). That is, this article aims to corroborate whether agroecological cooperativism, which emerged in the late 20th century -and grew with remarkable strength during the second decade of the 21st century- and the profound crisis of legitimacy of the democratic institutions, with a rising participation in citizen extra-representative and extra-institutional movements, is connected. This article has a double goal. On the one hand, to assess the existing relation between consumer and cooperative groups and the 15M movement and their ideological similarities, as selfmanaged movements that aim for social and political transformation. On the other hand, if applies, to study how this relation is shaped. The main hypothesis of our research is that nowadays agroecological cooperativism possesses an acute activism component, which is why it is reasonable to predict a relative involvement of this activist cooperativism in movements such as 15M. However, former literature has explained and described the 15M movement as a form of activism that eminently operates outside the institutions and through a network organization. From that point on, a second hypothesis is formulated, proposing that activist cooperativism participation occurs individually, rather than collectively and/or institutionally. That is, it is possible to identify overlaps between activists that take part both in cooperatives and social movements such as 15M, but it is not reasonable to foresee a relevant level of involvement of cooperatives, as collectives, in this movement. In order to respond to the hypothesis, a questionnaire comprising two sets of questions has been designed. A first set aims to determine the level of accomplishment based on the SSE criteria. A second set of questions focuses on the correlation between the studied organizations and the 15M movement, and the relevance of ICT in their organization. Semi-structured interviews were sent between February 2015 and March 2016 with a sample of 44 groups and allowed us to gather information regarding the origins, motivation and functioning of each of them. The questionnaire about the relation between the groups and the 15M movement was sent between December 2015 and March 2016, and 37 responses were collected. Thus, the 37 groups that have completed both questionnaires and the semi-structured interview will be considered the sample for this research. In order to assess the accomplishment level of the variables corresponding to each of the aspects of the Social Solidarity Economy and the relation of the organizations with the 15M movements, we have performed arithmetic measurements for each of the variables studied. To evaluate the performance of the formulated hypothesis we have applied a correlation and a factorial analysis upon the studied variables (Commitment, Ideology, Technology, Group Involvement and Individual Involvement) to quantify the existing association between variables (correlation) and to identify the latent existing relation between them (factorial), with the goal of gathering additional information that has allowed us to interpret the results of the individual classification (nonhierarchical segmentation). Once the groups have been obtained, significant differences between segments have been determined through a variance analysis (ANOVA). The results of our research show that consumer groups are part of a larger group of organizations that conform the Social and Solidarity Economy (SSE), which, among others, values the promotion of spaces in which democratic participation is emphasised. If we constrain our analysis to 2011, just in a few cases the creation of new groups can be drawn from the influence of 15M. However, the entities created that year recognise the movement as an agent of change for the individuals in their condition of activists. At the same time, this research allowed us to determine three types of organizations: the traditional cooperative, which shows a low level of social commitment and a moderate level of individual participation, and that barely embraces ICT; the network cooperative, which adds social commitment and ICT usage; and the activist cooperative, which presents a greater group and individual involvement. Despite the sample is limited in quantitative terms, the results confirm our hypothesis, which is to say, that cooperativism has a strong activist component. This finding points in the same direction with what Cantijoch (2009), Christensen (2011), Anduiza et al. (2014) or PeÃ±a-LÃ³pez et al. (2014) have expressed with regards to a strong (and even rising) tendency in extra-representative and extra-institutional practices when it comes to take part in political participation or citizen activism. On the other hand, despite the classification of the groups in traditional, network and activist cooperatives, we dare to say that their relation with the 15M movement must be, therefore, exogenous, depending on a non-identified variable, which is highly probable individual and not consubstantial with consumer cooperativism. That is to say, one doesnâ€™t affiliate to a cooperative – as itâ€™s the case as well with political parties, labor unions or NGOs- in order to achieve other political goals, but rather that oneâ€™s active participation in cooperativism constitutes the techno-political action by itself. Espelt Rodrigo, R., PeÃ±a-LÃ³pez, I. & RodrÃ­guez, E. (2016). “Â¿EconomÃ­a alternativa o tecnopolÃ­tica? Activismo desde el consumo cooperativo de productos agroecolÃ³gicos”. In CIRIEC-EspaÃ±a, Revista de EconomÃ­a PÃºblica, Social y Cooperativa, (93), 293-318. Valencia: CIRIEC. Peña-López, I. (2018) “Article. Alternative economics or technopolitics. 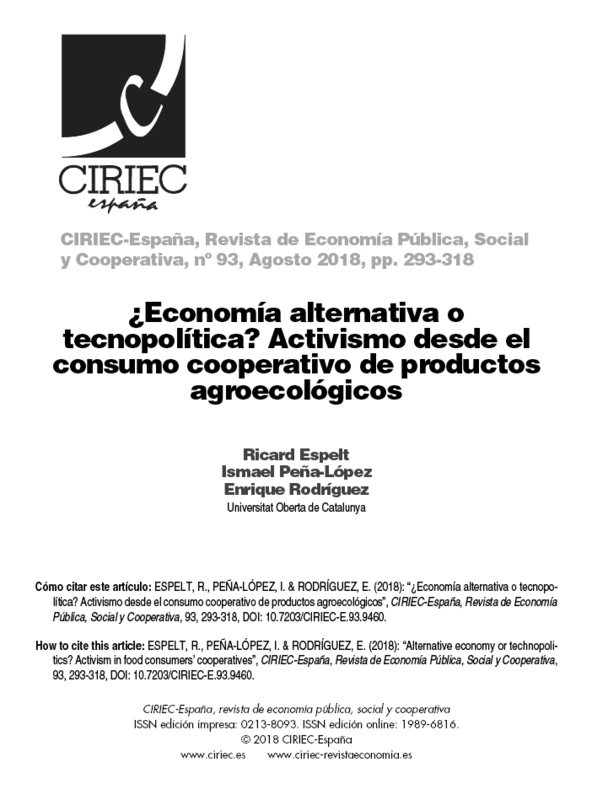 Activism from agroecological products cooperative consumption” In ICTlogy, #180, September 2018. Barcelona: ICTlogy.